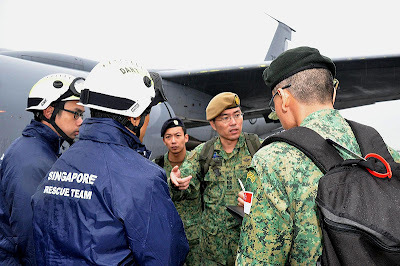 A 116-strong Singapore Armed Forces (SAF) team has begun to assist the New Zealand Defence Force (NZDF) and local authorities with rescue operations and providing humanitarian aid to victims of the earthquake in Christchurch, New Zealand since this morning. The SAF personnel have been deployed to help the NZDF with cordon operations to ensure the safety and security of the residents whose lives and homes have been affected by the earthquake. Describing the team's efforts, Major Xu Youfeng, Operations Officer Headquarters Guards, said, "We have been working closely with the NZDF and other New Zealand authorities to assist in the conduct of earthquake relief operations since this morning. The NZDF and the locals have been warm and hospitable during our stay here and we are very appreciative of their friendship. We will do the very best we can to help the victims of the earthquake." The SAF servicemen were participating in a humanitarian assistance and disaster relief exercise, codenamed Lion Walk, with the NZDF when the earthquake happened. Singapore also dispatched a 55-member Singapore Civil Defence Force (SCDF) urban search and rescue team and an SAF command team to assist in the disaster relief efforts early this morning. The Singapore contingent departed from Paya Lebar Air Base in two RSAF C-130s and one KC-135 military aircraft. The KC-135 aircraft arrived in Christchurch this afternoon and will be evacuating civilians out of the earthquake zone to Auckland, New Zealand. "The SAF servicemen were participating in a humanitarian assistance and disaster relief exercise, codenamed Lion Walk, with the NZDF when the earthquake happened..."
HQ Guards is the SME for "civil-military" operations now. They have a (inappropriately named) Civil-Military Relations Battalion now. So HQ Guard's participation in Lion Walk does make sense. 40s into it, you see an APC whiz by. It looks like a Terrex at first glance but I think it's a NZDF vehicle. I wonder what the role of APCs in the disaster relief will be. All-terrain platforms? Maybe HADR will be a shot in the arm for wheeled armoured vehicles. The KC-135 can fly non-stop to NZ. I wonder how many stops would the C-130 require? Check out the photo of one of our guardsmen manning the cordons. Thank you very much for providing the link.